Ingersoll Rand introduces the INSIGHTqc controller for critical assembly manufacturing applications. The INSIGHTqc helps manufacturers, such as those in heavy equipment, automotive and aerospace, who require advanced fastening strategies to take control of their assembly processes quickly. The controller powers Ingersoll Rand QE Series and QM Series transducerized assembly tools and collects data that manufacturers can act on in order to improve production. The INSIGHTqc controller stores up to 50,000 records of cycle data and 50,000 tightening traces onboard the device – one of the largest storage capacities of any controller on the market and 50 times more than the previous Ingersoll Rand model. 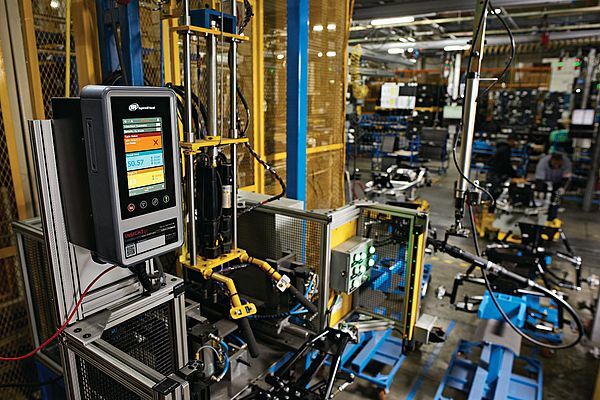 The INSIGHTqc controller is simple to set up and integrate into a manufacturer’s assembly operations, and can be connected to multiple devices. The fastening data is saved on an internal solid state drive and the controller can be connected to a network to also save the data on a plant’s server. Metrics and analytics are protected even if a network connection is dropped and can be studied any time for quality control.The INSIGHTqc saves training time and installation costs with an intuitive, touch-screen programming interface and ready-to-use protocols. An integrated memory backup and recovery capabilities reduce errors and downtime. The controller can support up to four plug-and-play accessories or devices, such as a barcode scanner or socket trays, with its four onboard USB ports. Operators can also save time and increase productivity with the integrated help system, an interactive icon that opens the corresponding digital pages of the user manual that apply to the active screen on the controller. The controller’s web-based software is compatible with smart phones, tablets and other Internet-based devices. The controller features easy line integration, integrated logic controls and helps reduce line rebalancing costs. It is also easy to upgrade the controller’s hardware and software to meet any tightening control requirements. The INSIGHTqc controller improves manufacturing productivity with onboard diagnostics and integrated statistical process controls that are represented visually, so manufacturers can correct fastening errors. The controller is also equipped with preventative maintenance alarms and configurable email alerts. Manufacturers can select optional plug-and-play accessories. The barcode scanner helps operators troubleshoot quality issues with specific parts, while the socket trays and bit trays aid in error-proofing the assembly process.